Born in Paris, France, on 13 June 1884, Étienne Henry Gilson was one of the leading Catholic intellectuals of the 20th century. While he was generally recognized to be one of the greatest historians of medieval philosophy of his time, Mortimer J. Adler considered him to be one of the few great philosophers of the age. Gilson’s early religious education started at home under the long-distance supervision of Ursiline sister Mother Saint-Dieudonne. In 1890, he entered the Christian Brothers’ run parish school of Ste-Clotilde where, among other things, he received educational grounding in Latin, catechism, and love of language. In 1895, Gilson left Ste-Clotilde to start seven years of education at the Catholic secondary school, Petit Séminaire de Notre-Dame-des-Champs. There he underwent rigorous training in classical (“humanistic”) studies that included ancient Greek, Latin, Roman and French history, mathematics, physical science, liturgy, and music. Gilson left Notre-Dame-des-Champs in 1902 to attend a year of studies at the celebrated Lycée Henri IV. While there Professor Henri Dereux introduced Gilson to philosophy, and he attended Lucien Lévy-Bruhl’s course on David Hume. Gilson graduated from Lycée Henri IV in 1903 with a bachelor’s diploma and certification from the Faculty of Letters at the University of Paris that would permit him to continue his studies at the Sorbonne. Between 1903 and 1904 Gilson completed his pre-university education by starting a year of military service. He spent most of this service in Normandy during which, beyond learning the art of soldiering, he read Léon Brunschvicg’s Introduction à la vie de l’esprit and René Descartes’s Les meditations métphysiques. Gilson enrolled in the Sorbonne in 1904 and completed his studies there in three years. Especially memorable to Gilson during this time were a course on Descartes he took under Lévy-Bruhl and a set of lectures that Henri Bergson gave at the Collège de France. Lévy-Bruhl’s course so strongly influenced Gilson that he decided to write his doctoral thesis on Descartes under Lévy-Bruhl’s direction. Other major thinkers with whom Gilson studied during this time included Émile Durkheim and Victor Delbos. After receiving his agrégation in philosophy in August 1907, in October 1907, Gilson was appointed a “provisional professor of philosophy” at the Lycée of Lalande in Bourg-en-Bresse, the first of several lycées at which he would teach. Having secured professional employment, on 10 February 1908 (in a civil ceremony) and 11 February 1908 (in the Church of Saint-Apais) in Melun, Gilson married his cousin Thérèse Ravisé. In October 1908, the Minister of Public Instruction informed Gilson that he would be transferred to teach at the lycée in Rochefort-sur-Mur. After teaching there for two years, in July 1910, Gilson gained an appointment to teach philosophy at the Lycée Descartes in Tours; in July 2011, he was transferred to the Lycée of Saint-Quentin. During this time, on 27 June 1912, Thérèse gave birth to the Gilsons’ first child, Jacqueline Marie Charlotte. In September 1912, Gilson transferred to teach philosophy at the Lycée of Angers. During this time Gilson defended and published his two theses: La liberté chez Descartes et la théologie (Gilson’s first major work) and Index scolastico-cartésian (an index of scholastic terms that Descartes had used). He also wrote a very significant article for the Révue de métaphysique et de morale entitled “L’innéisme cartésian et la théologie” in which, while studying Descartes’s doctrine of innate ideas in light of the teaching of St. Thomas Aquinas, Gilson started to shift his intellectual interest away from Descartes and toward St. Thomas. On 11 July 1913, Gilson signed an agreement to teach philosophy at the University of Lille from 01 October 1913 to 31 October 1914. Before his move to Lille, on 11 September 1913, his second daughter, Cécile was born. At Lille, among other things, he presented a public course he had titled “The System of Thomas Aquinas” that, surprisingly to Gilson, was generally well received. During this time Gilson also started to do research into the mysticism of St. Bonaventure and to defend his thesis on Descartes before the “Société Française de Philosophie.” Gilson’s academic career was interrupted by the outbreak of World War I. On 02 August 1914, Sergeant Gilson reported to Lille, to the 43rd Infantry Division, 28th Company to instruct recruits. Gilson’s military life initially took him to central France. When he reached Courtine around mid-October 1914, Gilson started to read volumes of the work of St. Bonaventure that he had brought with him. By mid-June Gilson found himself fighting Germans on the front at Verdun. By November, Gilson was moving back and forth between Verdun and Beaumark, where he was a machine-gun instructor. At Beaumark, between two shifts served in the trenches, Gilson composed the first of many articles he would write on the fine arts, “Art et metaphysique,” which was published in the Revue de metaphysique ed de morale in 1916. A major German offensive (that ended with Gilson being taken prisoner of war on 23 February and transferred to the prisoner-of-war camp in Mainz) interrupted his brief stint at writing. After a short stay in Mainz, Gilson wound up for several months in Vöhrenbach in the Schwarzwald. From there, in August 1916, he moved to an officers’ prison camp in Burg-bei-Magdeburg. While at this camp, Gilson studied Russian and other living languages and, with the help of local book dealers who did a thriving business with the prisoners, continued his studies in philosophy. He even managed to publish an article “Du fondement des jugements esthétiques” in the Parisian Revue philosophique de la France et de l’étranger. In 1921, while still at Strausbourg, Gilson published his Études de philosophie médiévale. In the same year, he moved to Paris to become a member of the Faculty of Letters and informal historian of medieval Christian philosophy, director in medieval philosophies and theologies, at the Sorbonne. Shortly thereafter, he was appointed to the Section of Religious Sciences of the History of Doctrines at the École Pratique des Hautes Études. Between 1921 and 1923, Gilson’s international reputation started to increase and he acquired a large following of students and some future friends, such as Henri Gouhier. His work at the Sorbonne and the École heavily concentrated on St. Augustine, and his work at the Sorbonne also focused on study of St. Bonaventure. During the summer of 1922, Gilson became involved with a private relief program to help Russian and Ukranian famine victims. Upon his return Joseph Vrin publishers in Paris released the second, updated, edition of his Le Thomisme. As Gilson’s international reputation started to grow, increasingly he began to attend international philosophical congresses and accept visiting lectureships. At these conferences he became friends with international scholars like Alfred North Whitehead and Ralph Barton Perry. In 1924, Gilson published his magisterial La philosophie de saint Bonaventure (Paris). He also wrote articles defending some of his theses and two critical essays, one about François Villon (“De la Bible à François Villon,” summaries of which were published in Annuaire de l’École Pratique des Hautes Études [1923–1924]) and another on Rebelais and Rabelais scholar Abel Lefranc (“Rabelais franciscain,” published in Revue d’histoire franciscaine). He followed this last article with his famous 1925 work René Descartes, Discours de la méthode: texte et commentaire (Paris). Between 1924 and 1925, Gilson also offered a course on St. Thomas’s moral teaching at the Sorbonne. This course became the foundation for his 1925 book on St. Thomas’s moral thought, St. ThomasD’Aquin (reprinted by J.Vrin in 1930 and 1974 under the title Saint Thomas D’Aquin moraliste). During this same year, among other reasons, because of the influence on him of Bergson and Drukheim, Gilson started to do research and write papers on the thought of François-Pierre-Gonthier Maine de Biran (1766–1824). By April 1926, his scholarly reputation within France and internationally having become well established, Gilson made his first visit to North America to participate in an international congress in Montreal, Canada, devoted to the topic “Education and Citizenship.” While in Montreal he gave a public lecture at the Major Seminary of Saint-Sulpice, and initiated his program to study medieval thought and organize medieval studies. After returning to Europe, before the end of July, Gilson inaugurated a scholarly journal devoted to medieval thought and its history: Archives d’histoire doctrinale et littériare du moyen âge. While at Harvard Gilson stayed at the home of Ralph Barton Perry and, between September 1926 and January 1927, gave two courses: (1) “Descartes on French Philosophy” and (2) “Medieval Scholasticism,” which he also gave at Radcliffe. During this time Harvard offered Gilson a full professorship. Gilson refused. However, he agreed to teach as a visiting professor during the fall semesters of 1927 and 1928. Also during 1926–1927, Gilson gave public lectures several cities in the United States and Canada. The first talk in the United States was at the Salon Français de Boston on “Spiritual Movements in Contemporary French Literature.” The second was a 22 November lecture on Jean-Jacques Rousseau at Cornell. The third, a 30 November 1926 talk at Wellesley College on “The Evolution and Meaning of Medieval Philosophy.” Gilson repeated this lecture at Brown University. He followed this with lectures to: (1) the Philosophical Club at Harvard, on 08 December; (2) the Alliance Française de Boston (about Jean-Giradoux, the playwright) on 15 December; (3) Albertus Magnus College on free will in the teaching of St. Albert the Great on 09 January; (4) Wellesley, on contemporary French literature, on 11 January, 1927; and (5) the University of Illinois on medieval theories of knowledge (based upon a recently published articles in the Archives “Pourquois saint Thomas a critique saint Augustin”), 15, 16, and 17 January; (6) the University of Chicago, also on medieval theories of knowledge, on 20 January; (7) Columbia University (on French philosophy) early February; (8) Barnard College (on scholasticism), early February. Gilson’s 1927 Canadian lectures were to (1) the Institut Scientifique Franco-Canadien in Salle Saint-Sulpice (inaugural lecture on “Saint Bernard, Founder of Medieval Monasticism”), on 22 January; (2) Le Cercle Universitaire, in Salle Saint-Sulpice, on 22 January about “Idealism in Contemporary Literature”; (3) an audience sponsored by the University of Montreal (on “The Theory of Knowledge According to St. Thomas”), again in Salle Saint-Sulpice, on 24, 25, and 28 January; (4) Institute Canadien at Laval University (on “Le thomisme”), on 26 January (5) McGill University (again on St. Bernard’s mysticism), on 27 January; (6) the Dominicans and the Alliance Française, on 29 January; (7) St. Michael’s College at the University of Toronto (repeating the three lectures on medieval theories of knowledge that he had given at the University of Illinois and participating in an evening discussion at the University of Toronto Philosophical Society). On 05 February 1927, Gilson left New York City to return to Paris, where he spent the rest of the winter and spring devoted to teaching and studying the works of St. Augustine and John Duns Scotus, refining his third edition of Le thomisme (which appeared in February of that year), and disputing about the nature of aspects of St. Thomas’s teaching. At its second annual meeting (29–30 April 1927) the Mediaeval Academy of America elected Gilson a corresponding fellow and, on 30 June, Oxford University conferred on him a Doctor of Letters, honoris causa. Gilson spent 03–05 November in Toronto giving three lectures on Thursday and one on Friday related to St. Augustine’s psychological thought, and participating informal discussions on Saturday about their proposed Institute of Mediaeval Studies at the University of Toronto. Gilson called three of his lectures, “The Nature of Sensations,” “The Origin of Ideas,” and “Memory and its Metaphysical Meaning.” He devoted the fourth lecture, delivered to the Philosophical Society, to matters that arose from the Thursday lectures. His conversation on Saturday focused on establishing a professional institute for all medieval studies, “a laboratory of the history of medieval civilization,” complete with offices, classrooms, mandatory classes, and collaborative methodology that would emphasize primary sources. Gilson returned to Canada to deliver three lectures on St. Augustine (at McGill, the University of Montreal, and to the Dominicans) and give ten public appearances in Montreal between 01 and 03 December 1927. After returning to Harvard from Montreal, on 05 December, Gilson went to a lecture and reception at the Alliance Française delivered by Paul Claudel. On 10 December, he returned to give a second lecture at Cornell. Before returning to France, he decided to accept the offer from St. Michael’s College at the University of Toronto and not return to Harvard on a regular basis. On 14 March 1928, Gilson responded to a presentation by Léon Brunschvicg delivered before the Société Française de Philosophie entitled “La querelle d’athéisme.” This debate helped convince Gilson that opposition to growing atheism made important his presence in France. To Gilson’s delight, his third child, a son (Bernard) was born on the day after the debate. During the rest of 1928, Gilson received many European, especially British, requests to deliver lectures and teach courses. The first came from the University of Aberdeen, Scotland, to deliver the famed Gifford Lectures on natural theology. He eventually delivered these in 1931 and 1932 under the title “Medieval Philosophy and Its Present Value.” For publication this title was eventually changed to The Spirit of Medieval Philosophy. Between 1928 and 1931, Gilson also lectured at (1) Cambridge University (“Middle Ages and the Renaissance”); (2) the University of London (“God in Descartes”); (3 and 4) the Universities of Leipsig and Marburg (“Cistercian Mysticism”); (5) the University College of Wales (“St. Bernard and the Love of God”); (6) Lady Margaret Hall, Oxford (inaugural address, P. M. Kinder Lectures). Gilson’s lectures at Leipsig and Marburg spurred him to write two articles for the newly founded journal, L’ européen, entitled “Autour de Benda: la mare aux clercs” and “Vues prises de Marbourg.” In the first article, like his friend and student Henri Gouhier, Gilson defended Julien Benda’s criticism of modern scholars and intellectuals for losing sight of the philosopher’s vocation to love and seek truth. In the second, Gilson criticized French intellectuals for abandoning the older French system of constructing and synthesizing in favor of the fetishistic positivist method of fact finding, of mistaking scientific positivism with unavoidable rational logic. Shortly after his return to Harvard in the fall 1928, Gilson traveled to Toronto from 01–03 November to give four lectures and meet with Fr. Gerald B. Phelan to discuss further detail about the Institute and talk about the Louvain and neoscholasticism. Two of the lectures were historical and textual examinations of the teaching of Roger Bacon. The third was a talk given to the University of Toronto Philosophical Society about medieval realism. The fourth was a presentation to clergy on the theme “Early Christian Philosophers.” Also in 1928, Gilson worked with Fr. Phelan to start to assemble a book collection for the Institute. Gilson’s return to France for the start of 1929 enabled him to witness publication of his book Introduction à l’étude de saint Augustin, which drew much criticism from Catholic and non-Catholic philosophers, among other reasons, for claiming Augustinianism to be a Christian philosophy. Gilson left France in the summer of 1929 to establish the Institute of Mediaeval Studies (later to become the Pontifical Institute of Mediaeval Studies [PIMS]) at the University of Toronto. He arrived in Toronto on 29 September 1929 and attended a Mass the following day formally to open the Institute. His duties as the Institute’s director included doing a lecture course and seminar each fall; personally directing the Institute’s students in medieval history, law, vernacular literature, paleography, and liturgy; assembling its research faculty (his general plan for the Institute was that it be directed toward research, not toward granting degrees); and, if possible, arranging for pontifical status from the Vatican. Gilson entitled his 1929 fall lecture course “The Thirteenth-Century Oxford School.” In addition to his activities at Toronto that year, Gilson gave two readings, plus commentary, of Paul Claudel’s poems for the Institut Pédagogique and a talk to the Cercle Universitaire. He followed these up with a talk in Quebec on “Le sentiment d’amour au moyen âge,” three lectures (on Sts. Bernard, Francis, and Dominic) in Ottawa, and lectures at Cornell and the University of Illinois. Following publication of Introduction à l’étude de saint Augustin, Gilson accepted an invitation to participate in an “Augustine-Thomist Week” in Rome, 22–30 April 1930, to mark the fifteen hundredth anniversary of St. Augustine’s death. 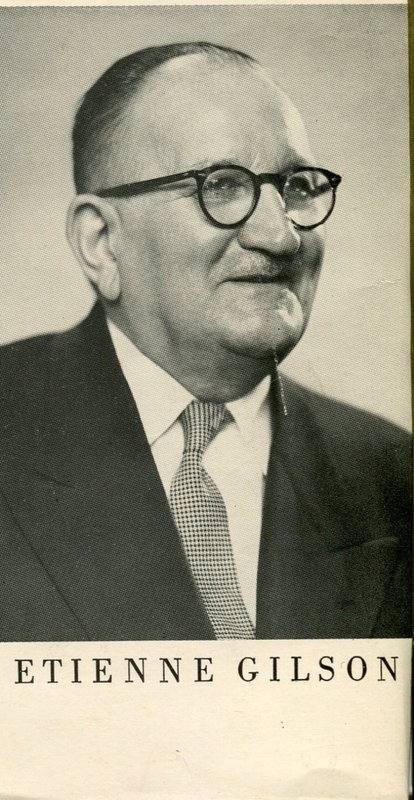 Prior to going to Rome, he published in Archives an important paper entitled “Les sources gréco-arabes de l’augustinianisme avicennisant.” In 1930, he also published Études sur la role de la pensée médiévale dans la formation du système cartésien. Gilson entitled his talk in Rome “L’idée de philosophie chez saint Augustin et chez saint Thomas d’Aquin.” (published in 1930 in Vie intellectuelle). Because of family illness, he was unable personally to present the paper. Later that year, he published a second paper for Augustine celebrations in London entitled “The Future of Augustinian Metaphysics” (published also in 1930, in Bulloch’s A Monument to Saint Augustine). A month prior to this debate (16–20 February 1931), Gilson started his Gifford Lectures with a discussion of the nature of “scholasticism.” He followed these with lectures on 29 May–02 June 1931; 08–12 February, 1932; and 30 May–03 June 1932. While Gilson was giving these lectures at the Protestant University of Aberdeen, Scotland, he realized that the notion of Christian philosophy had ramifications for Protestant thought. As a result, he started to delve into Protestant theology, including reading Martin Luther, Jean Cauvin (John Calvin), and the theologian Karl Barth. In 1932, Gilson gave a course on Luther and Christian philosophy at the École Pratique des Hautes Études that included an enrollment of twenty Protestant theology students. In 1933, he lectured at the Protestant Faculty of Theology, Paris, on “The Nature of Theology or Fides quaerens intellectum” and included Calvinism as part of his talk. In 1934, Karl Barth answered these lectures in a talk to the same Faculty. Also in 1932, Gilson received a Chair in the Collège de France, an appointment he considered to be of the highest order. To accept it, he resigned from the Sorbonne and the École Pratique des Hautes Études. When he gave his inaugural lecture on 05 April 1932 on “Le moyen âge et le naturalisme antique,” Gilson started a new era in his life that would last until 1951 during which Paris and the Collège de France became the hub of his intellectual activity. Between 1931 and 1969 Gilson offered the following among courses and lectures at the Institute: (1) “An Introduction to Christian Philosophy” (1931); (2)”Christian Moral Philosophy” (1932); (3) “The Social Function of Christian Philosophy” (co-taught with Gerald B. Phelan, 1933). “Epistemological Doctrines in the Thirteenth Century” (1934). (4) “The Philosophy of Duns Scotus” (1931); (5) “St. Bernard and Cistercian Mysticism” (1932); (6) “The Itinerarium mentis in Deum in St. Bonaventure” (1934); (7) “Duns Scotus” (1935); (8) “Intellect in the Work of Albert the Great” (1937); “Plotinus and Saint Augustine” (1938). (9) “Roman Classical Culture from Cicero to Erasmus” (1939); (10) “God and Greek Philosophy,” “God and Christian Philosophy,” “God and Modern Philosophy,” “God and Contemporary Philosophy” (1940); (11) “Being and Essence” and “Texts Relating to the Distinction of Being and Essence in Medieval Philosophy” (1946); (12) “Early Anglo-Saxon Humanism” and “Prologue to the Opus Oxoniense of Duns Scotus” (1947); (13) “The Infinite Being According to Duns Scotus” and “Texts Relating to the Notion of Infinite Being” (1948). 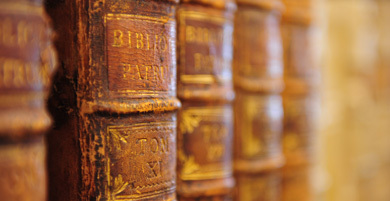 (14) “Applications of Esse in St. Thomas” and “The Seventh Quodlibetal Question of Duns Scotus” (1949); (15) “History of Medieval Philosophy” and the “Confessions of St. Augustine” (1951); (16) “From Traditionalism to Thomism” and “Books 11 and 12 of the Confessions of St. Augustine” (1961); (17) “Prolegomena to the ‘Prima Via’” (1963); (18) “The Spirit of Thomism” (1964); (19) “Renewal of Metaphysics” (1966); (21) “The Problem of the Non-Existence of God: The Difficulties of Atheism,” “Is God Dead?”, “The True Problem,” “Is the Non-Existence of God Even Thinkable?” (1968); “Language is Metaphysical,” “Words and Meanings,” and “Poetry and Metaphysics” (1969); (22) “Finalism Revisited” consisting of four lectures: “The Case for Mechanical Causality,” “The Case for the Mechanical Cause,” “Finalism and Physical Probability,” and “Evolution: Teleology and Theology” (1970); (23) “In Quest of Evolution” consisting of three lectures: “Darwin without Evolution, “Evolution without Darwin,” and “From Malthus to the Twilight of Evolution” (1971). Between 1932 and 1946, Gilson gave the following courses at the the Collège de France: (1) “L’esprit de la morale médiévale” (1932); (2) “L’école cistercienne et l’influence de St. Bernard” and “La doctrine de saint Anselme” (1933); (3) “L’idéal sociale du moyen âge” and “La métaphysique de Duns Scot” (1934); (4) “L’étude sur la psychologie d’Albert le Grand” and “Les theories de la connaissance au moyen âge” (1935); (5) “Les fondements du réalisme medieval” et “Les origins médiévales d’humanisme” (1936); (6) “L’idée d’humanité: recherché sur l’histoire d’un ideal medieval,” and “Humanisme et philosophie de Jean de Salibury à Pétrarque,” including the love story of Héoïse et Abélard (1937); (8) “Saint Augustin et le néo-platonisme” and “Les grandes crises de la pensée médiévale” (1938); (9) “Quaestiones disputatae sur saint Thomas d’Aquin” (1941–1942); (10) “Albert le Grand” (1942–1943); (11) “Les sources latines du platonisme médiévale” with a concluding lecture on “Le christianisme et la tradition philosophique” (1943); (12) “La dialectique de l’être et de l’existence chez S. Augustin” (1945–1946). On 21 November 1933, Gilson returned to Massachusetts to deliver an afternoon lecture at Harvard about “The Social Function of Theology” and an evening lecture at Wellesley. The next day he participated in a “Heidegger evening” at Harvard at which time he gave Ralph Barton Perry a tentative commitment to come to Harvard’s August–September 1936 Tercentenary celebration and receive an honorary degree. A few days later, he received another invitation to stay at Harvard from October through December to give the William James Lectures. Around mid-December, 1933, Gilson presented a series of three lectures on “Le société chrétienne universelle” at Salle Saint-Sulpice, Montreal. At this time, Gilson started to become convinced that, by decreeing faith and reason to be irreconcilable and by separating the political world into one empire directed by the pope and another by the prince, Latin Averroism had fractured the medieval Christian hope of a Christian social order rooted in moral law, justice, and charity. In 1934, under the influence of Fr. Phelan and Basilian Fr. Henry Carr, Gilson went to Rome with them to hold meetings with the Sacred Congregation of Seminaries and Universities to discuss a charter for the Institute. After these meetings, in late March of the same year, Jacques Maritain accompanied Gilson to a private audience with Pope Pius XI. This meeting put the request for a charter firmly on the Congregation’s agenda. After a provisional refusal in 1936, final approval came on 21 November 1939. Beyond this, in 1934, Gilson published La théologie mystique de saint Bernard. Also in 1934, in preparing a policy statement for another journal, Sept, which his friend Fr. Bernadot had just established, to unify French Catholics and reverse the French republic’s educational program of secularization, Gilson repeated this theme of overcoming the political divorce between faith and reason. This policy statement then served as background for a collection of articles entitled Pour un ordre catholique that he published in Sept related to education and political and social problems. At the same time Gilson was writing these articles for Sept, he started to compile papers on a second major theme on which he had been working since 1929: Thomist realism. In the early 1930s, Yves R. Simon gathered these papers together and published them in his “Cours et documents de philosophie.” Gilson would later publish the articles in two books that attacked the notion that someone could be a “critical realist” and simultaneously be a faithful student of St. Thomas: (1) Le réalisme méthodique (Paris, 1936) and (2) Réalisme thomiste et critique de la connaissance. In these books Gilson emphasized that the first principle of methodical realism is the same as the first principle of all human knowledge: an existing being, something that exists. Hence, Thomists deceive themselves when they think that a Kantian critique of knowledge or some sort of metaphysical reasoning must serve as a starting point of doing philosophy. Among other neo-Thomists, in 1931, in a paper published in the Dominican journal, Revue des sciences philosophiques et théologique, Fr. M. D. Roland-Gosselin reacted negatively to Gilson’s article. In 1932, Gilson answered Roland-Gosselin in a lengthier and more detailed article in the same Revue. This article would become chapter 2 of Gilson’s Le réalisme méthodique. Chapters 3, 4, and 5 of this same book consist respectively of these articles: “Autour de la philosophie chrétienne: la spécificté de l’ordre philosophique” (first published in La vie intellectuelle, 1931); “La méthode réaliste” (first published in Revue de philosophie, 1935); and “Vade-mecumdu debutant réaliste” (also first published in Revue de philosophie, 1935). On 13 February 1935, Gilson went to London, England, to present a paper on “Saint Thomas Aquinas” to the British Academy (published in the same year in Proceedings). Shortly after this, France named him a “Chevalier de la Légion d’Honneur” and “Membre du Conseil Supérieur de la Recherche Scientifique.” This second position required Gilson to participate in works of public foreign service in education, instruction, and external affairs. In 1935, this position committed Gilson to present three special series lectures to the: (1) Institut Français de Vienne, 13–17 May; (2) Faculté Catholique de Salzbourg, 17–21 May; and (3) Faculté des Lettres of the university in Rio de Janeiro, late July–19 September (a survey course of fourteen lectures on the history of French philosophy and two talks on “L’action catholique” and “L’ordre catholique”). After finishing his lectures in Rio de Janeiro, Gilson returned to Toronto in September 1935 to start regular classes. Just as his course lectures focused on Duns Scotus, so did his public lectures. In the early fall he gave two Ottawa lectures, and then five in Montreal (for a group of Capuchins of the Monastery of the Reparation and his annual lectures for the Institut Scientifique) showing the authenticity of Scotus’ Theoremata. He later published these findings in two journal articles: (1) “Metaphysik und Theologie nach Duns Scotus, in Franziskanische Studien (1935) and (2) “Les seize premierstheoremata et la pensée de Duns Scot,” in Archives (1938). After lecturing in Montreal, Gilson then gave talks at (1) Assumption College, Windsor, Ontario, in October; (2) Notre Dame University, the Alliance Française in Washington, D.C. and New York, and Smith College in Massachusetts in November. Gilson returned to France in December, 1935. Gilson spent much of the spring and early summer of 1936 in France preparing his Harvard lectures. After arriving in Boston on 29 August, on 02 September he delivered a lecture on “Medieval Universalism and Its Present Value” in which he argued that (1) four foundations of medieval universalism existed (rationalism, realism, personalism, and the philosophical quest for “truth universal in its own right”) and (2) modern man can only gain by emulating this approach and comprehending truths through an intellectual, personal, and universal knowledge. On 02 October 1936, Gilson delivered the first of his William James lectures, which were first published in English in 1937 under the title The Unity of Philosophical Experience. During the fall of this year he returned to Toronto three times (10–14 October, 7–11 November, and 6–9 December) to lecture at the Institute and meet with students. During the second visit, Archbishop James Charles McGuigan presided at the Institute’s inaugural and the Institute started to function under provisional Pontifical status awaiting Rome’s final approval. When Gilson returned to the Collège de France for the spring semester 1937, he started his course on medieval humanism with the famous love story of Peter Abelard and Heloise. Needless to say, this course was a hit with the students. So, too, were Gilson’s 1937 fall Institute seminar on Albert the Great and his 1938 seminar on Plotinus and Augustine. Shortly after his mother’s death on 24 March 1937, Gilson delivered the Richard Lectures at the University of Virginia. In this series, he returned to the Latin Averroist problem of double truth that he had briefly examined in 1931. This series was published the next year under the title Reason and Revelation in the Middle Ages. Gilson was in France when Germany invaded Poland on 02 September 1939. Likely, under direction of the French government, he sailed for Canada in mid-September. After arriving in Quebec City on 22 September 1939, spending time with friends, engaging in war propaganda efforts on behalf of France, and traveling to Toronto, on 19 November 1939, Gilson lectured in Montreal on the “Société universelle,” a topic he had prepared to deliver at St. Michael’s College in Vermont. In December, he talked to Montreal’s Institut Scientifique Franco-Canadien about “l”Europe et la paix.” After giving other talks in Montreal between 23 and 25 January, he lectured at the College Saint-Alexandre d’Ironsides and in Ottawa at the Alliance Française. According to Shook, during this period, Gilson’s main motivation “was to drive home to his Institute students that in humanism lay the best antidote to the venom of war. For Gilson medieval universalism, or “true humanism” as Maritain called it, held the key to the ultimate health in the human condition.” Because Gilson thought that to be of use students needed to analyze Christian humanism philosophically, he thought he had to present humanism within the context of the lives of men who lived it. Hence, in the fall, 1939, after publishing his monograph Dante et la philosophie(Paris), Gilson offered to his Toronto students a public course of twelve lectures on “Roman Classical Culture from Cicero to Erasmus” in which he led his students through the transmission of classical humanism to Christianity through a series of renaissances covering the eighth through the fifteenth centuries. On 18 October 1939, while Gilson was in Vermont, the Vatican had granted his Toronto Institute a pontifical charter. Within a month Gilson traveled extensively. Between 02 and 08 March 1940, Gilson expanded these talks into his Powell lectures at the University of Indiana (published by Yale University in 1941 under the title God and Philosophy). In these talks, instead of focusing on individual texts and persons, Gilson shifted his focus toward general themes and tried to develop the implications of St. Thomas’ metaphysics of being relative to the whole problem of God’s existence. From Bloomington, Indiana, Gilson traveled to Massachusetts where he gave a talk about “La France et la guerre” to French-Americans in New Bedford, Worcester, Woonsocket, and Manchester. On 03 April, Gilson went to New York to start his return trip to France, where he remained for the duration of World War II. Apart from twice attempting to get Gilson to collaborate with them, and having Nazi soldiers billeted in his Paris apartment and house in Vermenton, Gilson says the Germans left him alone for the duration of the War. Soon after his return to France, Gilson started to do an extensive, fourth, revised and enlarged edition of Le Thomisme. Soon after its publication in 1942, he started revising it again in light of his increased understanding of the esse/essentia distinction in St. Thomas. In 1943, in light of criticisms that had been lodged against his first edition, Gilson published a second edition of Introduction à l’etude de saint Augustin and of La philosophie de saint Bonaventure. In 1944, he published a revised edition of his La philosophie du moyen âge des origines patristiques à la fin du XIVesiècle. The success of this volume caused it to be reprinted in 1945, 1947, and 1948. Between 1942 and 1943 Gilson gave courses at the Collège de France on: (1) “Quaestiones disputatae sur saint Thomas d’Aquin” (1941–1942); (2) “Albert le Grand” (1942–1943), and (3) “Les sources latines du platonisme médiévale,” with a concluding lecture on “Le christianisme et la tradition philosophique”) (1943). Gilson later published this concluding lecture in the Revue des Sciences Philosophiques et Théologiques (1941) and Cherchez Dieu (1943). Shook maintains that Gilson’s choice to publish this article in these two Catholic journals “served notice that Gilson’s perspective was shifting from philosophy toward religion.” Gilson’s life was entering a new, spiritual phase in which he started to become preoccupied with spiritual life. Evidence of this turn is his article, “Sagesse et société” in which Gilson deals with wisdom as a gift of the Holy Spirit. As World War II came to an end, Shook says that Gilson became increasingly devoted to realizing the possibility of that ordre catholique he had advocated in the 1930s. He was convinced that “German hitlerism, Russian communism, Italian and Spanish fascism and American Deweyism had stood in the way then: each of them had focused on the production of their own brand of citizen, and not of them had seen a pressing need for the teaching of moral and intellectual virtue. Now . . . real changes were finally possible.” In 1945, to address these changes, Gilson wrote an article for Le monde entitled “Instruire ou éduquer?”in which he argued for the need to (1) have greater concern for students as individuals, not prospective adherents to a political cause, and (2) familiarize students from infancy with moral virtues of the individual such as honor, duty, justice, and piety. He quickly followed this article with four others that had the same keynote theme: “The first step of any totalitarian regime is to seize the schools in order to have exclusive monopoly over shaping tomorrow’s citizens.” In these articles, Gilson sought to focus educators’ attention on inculcating personal virtue, not the power of movements. He entitled them: (1) “Hitler fera-t-il notre revolution?”; (2) “La circulaire 45 ou: comment l’on se propose de pervertir la vérité”; (3) “La revolution ou l’amitié redressera la Cite”; and (4) “La schisme national.” He published the articles in Stanislas Fumet’s religiously-oriented journal Hebdomadaire du temps present. About a month after publishing these articles, Gilson published “Pour une education nationale” in La vie intelletuelle. He argued therein that free education must include religion. Apparently, before going to print, the Journal’s editor sent the article to General Charles de Gaulle, who read it shortly thereafter. In another article published around this same time in La croix, entitled “La liberté de l’enseignement en Angleterre,” Gilson expressed his admiration for the open British conformist and non-conformist educational policy in contrast to France’s closed State-controlled one. On 15 March 1945, he spoke before a packed meeting of “La Jeunesse Intellectuelle” in La Grande Salle de la Mutualité. As a result of these educational works, Gilson started to correspond with many of the leading intellectuals in post-liberation France and to become recognized as a spokesman for them. As a result, the French Ministry of Foreign Affairs selected him to join his friend Jacques Maritain as part of the French delegation the 1945 San Francisco meeting to plan the United Nations charter, which was signed on 26 June of that year. After returning to Toronto for a few months in anticipation of teaching his fall courses there, the French Foreign Ministry informed him that the Ministry had named him to participate in the October and November 1945 London conference designed to create the constitution for what would later become UNESCO, the United Nations Educational, Scientific, and Cultural Organization. Gilson served on the committee that drafted UNESCO’s constitution. During his stay in London, Gilson wrote five articles about the conference that were published in Le monde. Several others appeared over the next several years. In them, among other things, Gilson expressed his disappointment about the limited roles intellectuals would actually have in UNESCO. He also later expressed disappointment about the behavior of intellectuals at UNESCO’s first general conference in Paris in 1946. In a radio discussion in which he took part with several other conference participants after the meeting regarding the question “Can UNESCO Educate for World Understanding,” Gilson maintained that the world would not be ready for global understanding until university education became more international than it then was. Despite Gilson’s heavy political agenda during 1945, in that year he managed to publish three articles regarding the relation between the existentialism of St. Thomas and twentieth-century existentialism: (1) “Limites existentielles de la philosophie” (in L’existence); (2) “Pierre Lombard et les théologies de l’essence” (in Revue du moyen âge latin); and (3) “Le thomisme et les philosophies existentielles” (in La vie intellectuelle). Since Gilson had not lectured at PIMS for over five years, he cut short his course in France to go to Toronto in late February 1946. He then conducted abbreviated lectures in Canada from early March to early May. While in Canada, he became involved in a debate about whether Canadian literature was, properly speaking, French or Canadian. Gilson took the latter position in an article in Le monde(“L’arbre canadien”) and a Canadian radio address ((La 852e emission de la Société du Bon Parler, later published in La patrie under the title “L’arbre canadien: le canadien, notre égal”). Gilson returned to France in May 1946 and, tired and wanting to stay with his family for some time, remained there until the following fall. On 24 October 1946, the Académie Française elected him a member. After this he spoke on 20 November about “Pétrarque et sa muse” while giving the Philip Maurice Deneke Lecture at Lady Margaret Hall, Oxford. Next, on 21 and 22 November, he lectured the Faculty of Divinity of the University of London about “The Judgment of Existence and Its Relation to the Problem of God.” He returned to London in January 1947 to give a radio lecture. In March, he gave talks in Liège and Brussels. In April, Gilson went to Rome to participate in meetings of the Pontifical Academy of Thomas Aquinas and an international meeting to establish Pax Romana as an international movement of intellectuals engaged in the service of God. At the Pontifical Academy he spoke on “The Knowledge of Being.” At Pax Romana he talked about “Les intellectuals dans la chrétienté” (published in the same year in Travaux et documents). In the talk, among other things, Gilson argued for the need for the modern state to condemn oppression of individual freedom and extend and guarantee personal freedom, including economic and social freedom, and personal property ownership, to everyone. While in Toronto for the fall, 1947, Gilson busied himself with new courses on Duns Scotus and public lectures. In the spring, 08 April 1948, Gilson addressed the Semaines des Intellectuals Catholiques on the theme “Intellectuals and Peace.” This lecture considered the post-World War II “Terrors” that would result from the West embracing Friedrich Nietzsche’s proclamation of God’s death. The lecture was subsequently published in 1949 in English, in Toronto, under the title “The Terrors of the Year 2000,” and in French under the same title, “Les terreurs de l’an deux mille” (in La revue and in Revue de l’Université d’Ottawa). Shortly after Gilson returned to Canada in September 1949, he delivered an evening lecture at St. Thomas More College of Saskatoon on “St. Thomas More and the Law.” He followed this with a lecture the next morning at the University of Saskatchewan on “Politics and Philosophy.” In the article, Gilson argued about the relationship among tolerance, dogmatism, skepticism, and truth. He maintained that no necessary connection exists between dogmatism and intolerance or skepticism and tolerance. He claimed that skeptics qua skeptics cannot be tolerant and dogmatists qua dogmatists need not be intolerant. Skeptics qua skeptics can only be permissive, not tolerant. Strictly speaking, only the person who admits the existence of truth can be tolerant. Gilson argued further that tolerance is a moral, not an intellectual, virtue rooted in the political virtues of justice and friendship; and that tolerance and intolerance exist essentially in the political, not the intellectual, order. This lecture was subsequently published in the University’s journal Le Sheaf. Gilson expanded the lecture, presented it at Rutgers University, and later published it under the title Dogmatism and Tolerance. 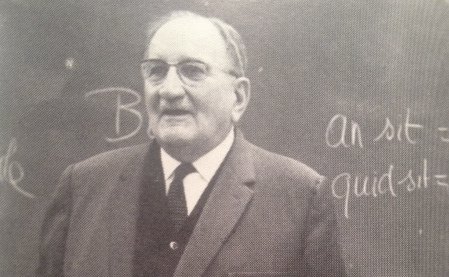 In the fall, 1949, Gilson’s courses at the Institute were scheduled to be “Applications of Esse in St. Thomas and “The Seventh Quodlibetal Question of Duns Scotus.” Shortly after arriving in Toronto from Saskatoon, Gilson had return early to to France. Word had come to him that his wife Thérèse was seriously ill. He returned to Paris where his wife died on 12 November 1949. Shook maintains that, after his wife’s death, Gilson sank into serious depression that distraction from work on Duns Scotus and his course at the Collège de France, which started in December, helped somewhat to alleviate. Early in January, 1950, Gilson presented a currently unpublished address to the MRP in Paris about “Political Liberty and the Parties.” In the talk Gilson praised the movement’s respect for the individual freedom of its deputies to be able to think for themselves, not tow the party line. He claimed that the party’s program: (1) regarded the family, not the political party, as the real center of French social organization; (2) would not nationalize industry unless needed for normal production and distribution; (3) would support revolutionary union objectives only if they were legitimate; (4) would treat every French citizen as an individual moral agent possessed of intellect, will, and the faculty of free choice—not as a number; and (5) advocated no State religion, official science or philosophy, and did not discriminate in the area of teaching. Gilson considered his paper on the “Critical-Historical Research and the Future of Scholasticism” to be “an H-bomb” because, in it, he had argued that scholasticism is no philosophy in its own right, that it must return to theology to function correctly. He claimed that medieval scholasticism had developed as a result of theology turning the light of revelation upon the metaphysics of the ancient philosophers, that it was a handmaid to theology, and that theology must continue to reflect upon science, whether the “science” be “science” in the modern sense or classical metaphysics. After his course at the Collège de France ended in March 1950, Gilson went to Sweden, where, between 12 March and 02 April, he delivered eight lectures on St. Augustine. After the two congresses finished, in September, 1950, Gilson went to Toronto to deliver two courses: (1) “Intellect and Will” and (2) “Illumination in Duns Scotus.” As part of his commitments outside PIMS, he agreed to lecture at (1) the University of British Columbia, (2) the University of Notre Dame, and (3) Marquette University. On Sunday, 03 December, Gilson repeated at Marquette the fourth lecture he had given at Notre Dame. After returning to Toronto on Monday, 04 December, on 12 December, Gilson wrote the French Ministry of Public Instruction that he wanted to retire from his position at the Collège de France starting 01 January 1951, something that he was legally entitled to do. He had wanted to divide his time almost equally between France and North America and to devote the next three years to teaching at the Toronto Institute to which he had given birth and had started to see grow. On 17 and 22 February, Gilson finally broke his silence, publishing replies to his accusers in Paris’s two leading newspapers: Figaro littéraire and Le monde. Gilson did not think his letter to the former publication had achieved much; but he thought he fared better in the latter in which he accused French Catholics of playing into Russia’s hands by equating all communists with Moscow imperialists, thereby driving into Moscow’s camp many people who were simply searching for different forms of liberty. Gilson was living in Toronto when the “L’affaire Gilson” was in full force in Paris. On 22 April 1951 he gave a centennial lecture at St. Francis University in Antigonish, Canada. In May, he returned to Paris. On 20 June, Gilson received an honorary doctorate from the University of Glasgow, which was celebrating its five hundred year anniversary. On 26 July, Gilson returned to Toronto to deliver a lecture course on the “History of Medieval Philosophy” and a seminar class on the “Confessions of St. Augustine.” During this year Gilson also published a work on aesthetics entitled L’école des muses(later translated into English by Maisie Ward and published in 1953 under the title Choir of Muses. After 1951 until 1957, when Canadian income tax laws became too prohibitive for Gilson to work there, Gilson would spend seven months in Canada and five in France. After that, until he left Canada entirely, he would spend three months in Canada and the rest in France. 1952 was a busy year for Gilson during which he lectured extensively on three main themes: (1) ethics and education, (2) contemporary science and philosophy, and (3) Christendom as the City of God. He gave his first talk on 02 February, Candlemas Day, to St. Michael’s College Adult Education Program on “The Breakdown of Morals and Christian Education.” He later repeated this talk, which was published twice, at St. John Fisher College, Rochester, New York, and other places. On 22 February, he spoke before the Alliance Française in Toronto. Between 27 and 31 March, he gave three talks at the University of Montreal and one for the Institut Franco-Canadien (also in Montreal). In mid-April, he read a paper on “Science, Philosophy, and Religious Wisdom” at the annual meeting of the American Catholic Philosophical Association (ACPA), published the same year in the Association’s Proceedings, on the occasion of receiving the Association’s Cardinal Spellman Aquinas Medal. Also in April, he delivered a radio version of this paper entitled “Religious Wisdom and Scientific Knowledge.” On 23 April, Gilson flew to Belgium to (1) give a series of ten lectures between 29 April and 19 May on changing understandings of the City of God and (2) dedicate the Cardinal Mercier Chair at the University of Louvain. On 22 September, Gilson was back in Canada to represent the Académie Française for the centenary celebration of the University of Laval and to receive an honorary doctorate from Laval. He spoke there about the first French book published in Canada, in 1765: Msgr. Jean-Joseph Lenguet’s Catéchisme du diocese de Sens. On 06 October he presented a paper entitled “Education and Higher Learning” as the inaugural address for St. Michael’s College’s centennial. In this paper, among other things, Gilson criticized the tendency of modern democratic governments to present education as if it were a commodity. On 24 February, 1954, Gilson gave an informal talk on philosophy and art at a Jesuit seminary in Toronto. On 29 April, he presented a paper at Mount St. Vincent College in Halifax, Nova Scotia. Between 20 and 26 June, he participated in the Third Annual Congress for Peace and Christian Culture in Florence. While there he gave a paper on “L’universalisme et la paix.” He followed this up between 19 and 22 August with six lectures at the new Centre d’Études Supérieures de Civilisation Médiévale at Poitiers. During the fall of 1954, Gilson returned to the United States to participate in a conference on the “Unity of Knowledge” at Columbia University and, along with England’s Queen Mother Mary and other dignitaries, receive an honorary degree. On 28 October, at Arden House, Gilson presented what Shook has called “one of the most important” papers of Gilson’s career, published in 1955 in the book The Unity of Knowledge under the title “Theology and the Unity of Knowledge.” During the same year, Random House published Gilson’s famous History of Christian Philosophy in the Middle Ages, and he wrote a preface for Doubleday’s textbook edition of John Henry Newman’s Grammar of Assent. In March and April, Gilson presented his metaphysical analysis of art in six Mellon lectures at the National Gallery in Washington, DC. These lectures were published in the Bollingen Series in 1957 under the title Painting and Reality. During the summer of 1956, Gilson gave a course of six lectures in Poitiers. He also started to prepare a paper for the Roman Academy of St. Thomas Aquinas entitled “Sur deux themes de réflexion.” The paper was published in a 1957 volume, Omaggio, written by Fr. Charles Boyer and dedicated to Pope Pius XII. Starting in 1957 Gilson began to turn down most invitations to give outside lectures. He made exceptions that year for (1) two unpaid talks given in February to the Alliance Française of Montreal; and (2) in early September for the twelfth “Rencontre Internationale de Genève” (an annual conference that had grown out of the UN UNESCO and Hague meetings in which Gilson had participated). At the colloquium Gilson spoke to the conference theme, “L’Europe et la liberation de l’art,” a topic that might have been generated by his Mellon lectures. During this same year, he accepted an invitation (1) from the American Academy of Arts and Sciences to become a member of a board of twelve scholars for an new quarterly journal: Daedalus; and (2) from the Faculty of Theology at the University of Freiburg-im-Breisgau to accept an honorary degree. He also wrote three important articles: (1) “What is Christian Philosophy?”; (2) “Le centenaire d’Auguste Comte” (published in Le monde for the centenary celebration of Comte’s death); and (3) “Amicus amicis” (an address to students preparing an Etienne Gilson Tribute [Milwaukee, 1959]). In the spring, 1957, Gilson was named general editor for a four-volume textbook on the History of Philosophy. He also had to fill in as a contributing editor. He left for Canada early in January, 1958, and did not return to North America until the winter of 1959. On 05 May 1958, Gilson was named a “Membre de l’Académie Royale de Belgique, Section des Sciences Morales et Politiques.” Also in May, he finished an article he called “Autour du thomisme,” the substance of which he later presented in a recorded lecture for the Pontifical Institute under the title “The Future of Christian Philosophy.” In June, he wrote the main article on Gabriel Marcel’s reception of “Le Prix National,” entitled “Un philosophe singulier” and published in Les nouvelles litteraires. And on 18 September he presented a paper on “L’oeuvre d’art et le jugement critique,” at the “Symposium d’Esthétiques” in Venice. During the time of this same Symposium, Gilson spoke at the Cini Foundation about Pietro Pomponazzi’s teaching on the immortality of the soul in a paper entitled, “L’affaire de l”immortalité de l’âge à Venice au début du XVIe siècle” (published in 1964 in Umanesimoeuropeo e umanesimo veneziano). Gilson underwent surgery in January 1959. This left him convalescing until spring. Still, he managed to write an “In Memoriam” tribute for the Archives regarding the death of Gabriel Théry; and, upon request, between March and December, he fulfilled functions of the Académie Française. In November, he traveled to Brussels and gave two public lectures for the Faculté Universitaire Saint-Louis: (1) “Un théologien devant les philosophes: St. Thomas d’Aquin” and (2) “Un philosophe devant les théologiens: Henri Bergson.” During this visit to Brussels he was inducted into the Royal Academy of Belgium. For the occasion, he gave an hour-long, spellbinding talk on “Philosophie du Plagiat” (“The Philosophy of Plagiarism”). On 21 November, 1959, Gilson chaired the meeting of “La Semaine des Intellectuels Catholiques” in Paris. The two speakers were Père M.-D. Chenu and M. Jean Lacroix. Shook reports that, in his summation of this discussion, “Gilson presented his last refined judgment on theology in relation to the thought of man. He came very near to saying that, for the believer, philosophy in the generally accepted sense of the word is an impossibility. He also offered one of the best explanations of why he now insisted so adamantly that St. Thomas had been a theologian who had used philosophy as a theologian” (Gilson’s summation appears in Semaines des Intellectuels Catholiques, Paris, 1959). 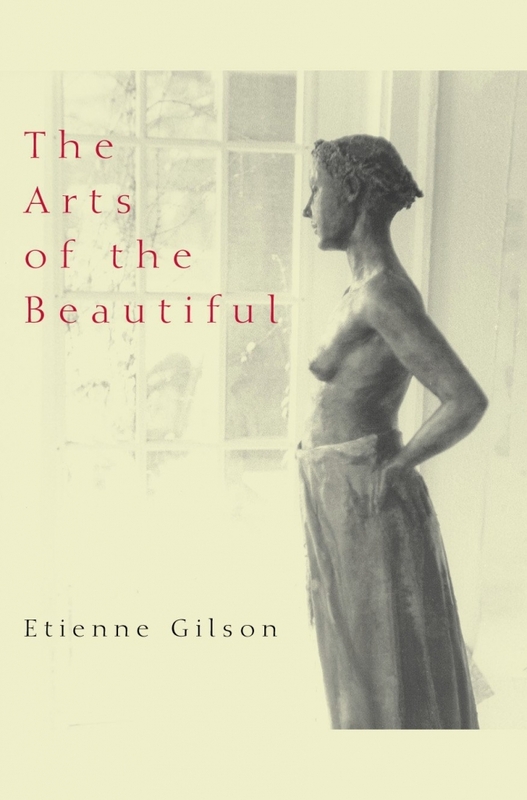 From around Christmas 1959, Gilson started working with his daughter Cécile to translate Le philosophe et la théologie into English. (It eventually saw publication in 1961 under the title The Philosopher and Theology.) For the next three years he also tried to resolve problems related to completing his four-volume History of Philosophy. This second project brought him to New York City for a meeting in early April at Random House publishers. This allowed him the opportunity, on 07 April 1959, to go to Hartford, Connecticut, to give a McAuley Lecture at St. Joseph College on the topic “Can the Existence of God be Demonstrated?” (published in 1961 in St. Thomas and Philosophy). On 07 March 1960, Gilson spoke at Rockhurst College, Kansas City, on “Paths to Peace.” An English translation of Gilson’s paper dedicated to Pope Pius XII (“Sur deux themes de réflexion”) and this talk at Rockhurst would later become the first and last chapters of Gilson’s 1964 book, The Spirit of Thomism. In addition to publishing The Philosopher and Theology in 1961, in that year he also published his articles, “Trois leçons sur le problème de l’existence du Dieu” (in Divinitas) and “Du la connaissance du principe” (in Revuede métaphysique et de morale). During the summer, 1961, Gilson gave a short lecture in Bolzano, Italy. And he planned to give a fall course on “An Introduction to the Theology of St. Thomas Aquinas” at the Harvard Divinity School. In a letter to Armand A. Maurer, Gilson even quipped that he would “enjoy speaking of a theologian without having to conceal that he is a theologian.” Health problems, including surgery, however, prevented him from giving this class. In 1962, Gilson published Il problema dell’ateismo, based upon an article he had written entitled “La possibilité de l’athéisme,” “L’être et Dieu” (in Revue thomiste), some articles in Mediaeval Studies, and his second edition of L’être et l’essence,.”. Gilson went from France to Canada toward the end of January 1963 and stayed until May 1964. While in North America, aside from his courses at the Institute, he gave six public lectures, many based upon his 1963 book, Introduction aux arts du beau. He followed up this book with his 1964 book on the fine arts: Matières et formes. Gilson ended 1963 upset by news that Burt Franklin had announced in New York a reprint of Gilson’s 1913 Index scolastico-cartesian. Gilson had not authorized the reprint and had refused money for the rights to republish it because he did not consider the complementary dissertation a complete work of scholarship. Returning to Europe in early January, 1965, Gilson remained there until October of the same year. One reason he stayed in Europe so long was to help him defend Thomism against growing assaults from theologians and liturgists who were trying to reduce Thomism’s in Church life. During this time he published his sixth, and last, edition of Le Thomisme. He also revised and presented several versions of a talk, “St. Thomas et nous” (one of which he gave in Rome on 13 April). On 06 September, he gave the only paper at the Solemn Inauguration of the Sixth International Thomistic Congress in Rome: “De la notion de l’être divin dans la philosophie de Sainte Thomas d’Aquin.” During the same year he also published an article “Trois leçons sur le thomisme et sa situation prèsente” (inSeminarium). Gilson was especially pleased when, at a reception for the members of the Congress at Castel Gandolfo, Pope Paul VI said, “Thomas is, was, and always will be the Doctor Communis . . . the master of all and for all” in the Church. In 1965, in preparation for the seventh centenary of Dante Aligheri’s birth, Gilson published in Archives, under the title “Trois études dantesque,” three previously written papers: (1)“Dante’s ‘Mirabile Visione’“; (2) “What is a Shade?”; and (3) “Poetry and Theology in The Divine Comedy.” He lectured on one or more of these papers in Florence (21 April), Montreal (29 October), Cornell (01 and 02 November), Toronto (05, 15, and 19 November), Berkeley, Augsburg, and other places. He also published an article entitled “À la recherché de l’Émpyrée” in the Revue des etudes italiennes. In September, 1965, Gilson lectured (1) for Count Cini in Milan about “L’industrialization des belles letters”; (2) in Rome, Turin, Naples, and, with variations, in Soisy-sous-Étoiles on “Saint Thomas et nous.” Gilson spent much of 1966 in France preparing fall lectures for Toronto and taking care of personal business. Before leaving for Toronto in October, he gave a paper to all five “Académies de l’Institut de France” on what he published the same year under the title Les arts et les letters. Gilson arrived in Toronto in the fall of 1966 with seven articles. Six related to “The Renewal of Metaphysics.” The seventh was a historical paper on “The Cultural Revolution of the Thirteenth Century.” Gilson delivered one to three of the six metaphysical papers at the Institute, St. Joseph’s College in West Hartford, Connecticut, Assumption College in Windsor, Ontario, and to other institutions. On 05 January, 1967, he gave his historical paper as part of the Distinguished Lecture Series, at the University of New Hampshire, Durham (the article was published in 1968 as part of that Series). In 1967, Gilson was quite busy. In February, he received an honorary degree at the University of Bologna. On 11 May, he spoke at the Pantheon for the unveiling of a tablet in honor of Bergson. On 29 May, he was in Berlin for a week where he attended the annual chapter of the “Orden Pouur le Mérite.” He limited his work in Canada to participation in the: (1) International Congress on the Theology of Renewal, Pontifical Institute of Mediaeval Studies, Toronto, 02 to 25 August (at which he presented a paper entitled “On Behalf of the Handmaid” [published in 1968 in Lawrence K. Shook (ed. ), Theology of Renewal]; and (2) Fourth International Congress of Medieval Philosophy, Montreal, immediately after the PIMS conference (at which Gilson spoke about “The Liberal Arts and Philosophy in the Middle Ages”). On 06 November, he received an honorary degree from the University of Liège. On 15 November, he participated in a radio tribute to Jacques Maritain. During the same year, Gilson published two books in the “Essais d’art et de philosophie”: (1) La société de masse et sa culture and (2) Les tribulations de Sophie. Between 23 February and 16 March 1968, Gilson lectured in Toronto on problems related to atheism: (1) “The Problem of the Non-Existence of God: The Difficulties of Atheism”; (2) “Is God Dead?”; (3) “The True Problem”; and (4) “Is the Non-Existence of God Even Thinkable?” Shook claims that Gilson had intended to do a major work on atheism and the idea of God, intending to call the to-be-published book “Constanes philosophiques de l’être.” While he never completed this work, after Gilson died, his friend Henri Gouhier made parts of the contents available in the 1979 book L’atheisme difficile. Before returning to Toronto in 1969, Gilson took a detour to Berkeley, where he arrived on 03 January to give two courses, one public, one specialized seminar, at the University. His public lecture, based upon the Summa theologiae, was on the authentic Thomism of St. Thomas. His seminar was devoted to texts of Avicenna and St. Thomas. From 09 to 15 April, 1969, Gilson was scheduled to be at the Accademia dei Lincei of Rome to participate in a symposium entitled “Oriental and Occidental Medieval Philosophy and Science” and to give a paper there on “Avicenne en occident au moyen âge.” While he wound up not attending, Thérèse d’Alverny presented “a compendium” of the talk to which she added a section, “Y-a-t’il eu un avicennisme latin?” (later published in Archives). Gilson devoted his 1970 lecture series in Toronto to the general topic, “Finalism Revisited.” The series consisted of four lectures: “The Case for Mechanical Causality,” “The Case for the Mechanical Cause,” “Finalism and Physical Probability,” and “Evolution: Teleology and Theology.” In 1971, Gilson published the material contained in these lectures in his book D’Aristote à Darwin et retour. In December 1970, he also gave a paper entitled “Propose sur le bonheur” to the Académie Française. Prior to giving his 1972 lectures in Toronto, under persistent pressure from the Dean of the School of Philosophy, Jude P. Dougherty, President Clarence C. Walton of the Catholic University of America invited Gilson to receive an honorary degree as Doctor of Human Letters from the University on 15 May 1971. While Dougherty was unable to get the president to invite Gilson to give the convocation address, he was able to exert enough pressure to have the University pay Gilson’s airfare. And Dougherty arranged for Gilson to give a “post-commencement” address in Keane Auditorium to a diverse audience of listeners from all over the Washington, DC area. On 07 March 1972, the Brazilian Academy of the Latin World awarded Gilson the Gulbenkian prize for philosophy in Paris. On 30 July 1972, he completed three more lectures that he had intended to give in Toronto the next academic year. The general topic of these lectures was “In Quest of Matter.” It consisted of three methods of considering matter, the: (1) ancient Greek, (2) Christian philosophical, and (3) “scientific” method followed after Descartes. His age and weakened health did not permit him to go to Toronto to present the lectures. Even though Gilson’s health continued to weaken, in 1973 he wrote a four-page introduction for John Osty’s translation of The Book of Wisdom. In September 1973, Thérèse d’Alverny and Pierre de Paulhac suggested for Gilson to publish some of his papers on Dante not readily known in France. This suggestion produced Gilson’s 1974 book, Dante et Béatrice: etudes dantesque. On 11 November 1973, Gilson gave an address over French radio on “la patrie.” In 1974, Gilson was pleased to see in print his article on “Quasi definitio substantia” (published by PIMS under the general editorship of Armand A. Maurer in the septicenteniary, 2 volume, edition commemorating St. Thomas’s death: St. Thomas Aquinas, 1274–1974, Commemorative Studies. Gilson spent his remaining years in the village of Cravant, France. During this time he received many visitors. On one occasion, his friend Henri Gouhier, a Commander in “La Légion d’Honneur,” conferred on Gilson the insignia of the “ordre pouré le Mérite.” On 20 February 1975, Gilson traveled to Paris, where the Académie de France conferred on him the gold medal they give to members who have reached at least the age of 90. In September, 1978, then age 95, Gilson moved from his house in Cravant to the Centre Hospitalier in Auxerre. While he continued to weaken physically, he remained intellectually alert and talkative until his death on 19 September 1978. His funeral Mass was said at La Cathédrale de Saint-Étienne in Auxerre. He is buried beside his wife, Thérèse, in the cemetery of Melun. Another valuable bibliographical resource for Gilson studies is Callistus James Edie, “The Writings of Étienne Gilson, Chronologically Arranged,” in Mélanges offerts à Étienne Gilson (Toronto: Pontifical Institute of Mediaeval Studies and Paris, J. Vrin, 1959), pp. 15–58. *Except for a few minor additions, all the content in the above Biography is derived from Lawrence K. Shook’s Gilson biography entitled, Étienne Gilson (Toronto, Pontifical Institute of Mediaeval Studies, The Gilson Series 6, 1984).